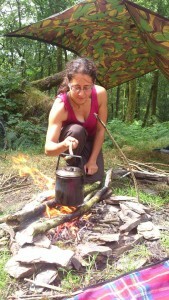 is a qualified Bushcraft Instructor, Forest School Leader and Wild Food Teacher. She runs Burn and Brae Wilderness School in Hebden Bridge, after many years working with Manchester Forest School and The Wood School in Manchester, which provides a nature based learning experience for urban children. After finishing a degree in Anthropology and Sociology and a Masters in Visual Anthropology, Leonie realised that it was being in nature that made her feel most alive. 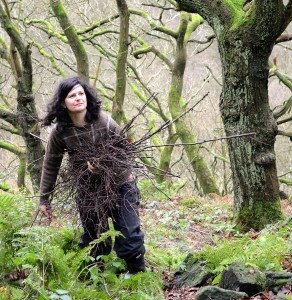 She began on the path of immersing herself in greenwood craft, foraging and fire making and over ten years later she is keen to share all her learning with others. As a small girl I remember I felt like there must be something very wrong with the world when I saw people starving on the news on TV. I was gobsmacked. How can some people have so much and others have so little and everyone be ok with this? This was a seminal moment for me, I was shocked and it stayed with me forever. The level of imbalance and disconnection to this inequality in our times is huge. And it’s complex, I know this. My mission as an adult thanks to this rude awakening has been to look at how I can be part of creating a more connected culture. Community has become so important to me in answering this, as has nature and finding my place in all of this. Over the years I have gathered and shared and gathered some more and been lucky to work with so many great teachers. I’m at a point where I feel I have developed a truly holistic and multi faceted approach. I believe Nature is our greatest healer. I have learnt from nature and become truly in love with the world around me. This is what I want to share. If those I work with now have even a jot of the amount of appreciation and love for all that surrounds us I know that I will have done something good in the world. My training and experience in front line Social Work, Non Violent Communication (NVC), Eco Psychology, Forest School and as an Eight Shields long term nature Mentor have brought me to an exciting place. I’m happy to work one-to-one, in groups, with professionals, young people or adult services. My work with Live Wild has enabled all of this. Nature connection is the key. In building this relationship within ourselves we will learn all we need to move forward with intent, passion, healing, support and wisdom. A little guidance is all it takes. 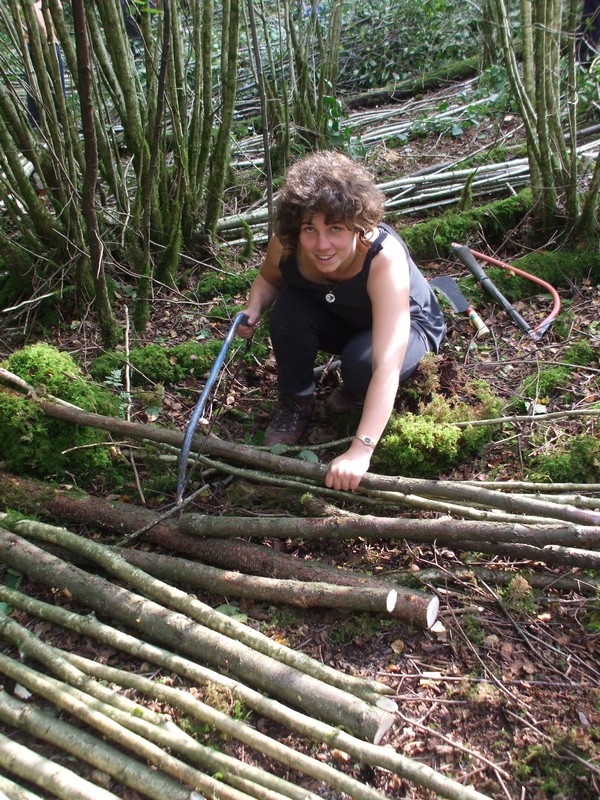 has worked with young people since 2000 as a Playworker, environmental educator, and Forest School Leader. 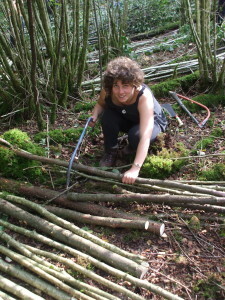 She was an apprentice woodsperson to Ben Law of “Grand Designs” fame. She holds chainsaw qualifications. In her spare time she makes rustic furniture. 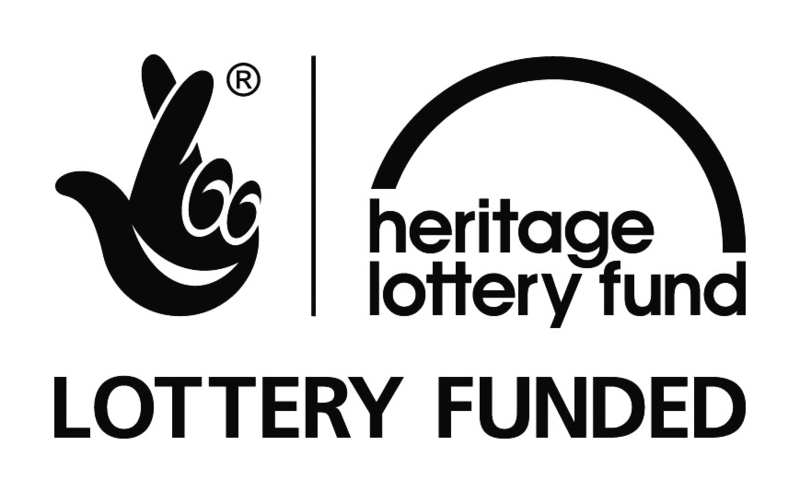 She also volunteered for The Woodland Trust as an Ancient Woodland Heritage researcher, researching and recording the history of local woodland. When she is not in the woods she is mumming a busy 2 year old. She has a degree in English. She has wwoofed in many stunning places visiting lots of forest schools on her travels. We sadly lost Laura in 2018. She is sorely missed. She was a founding member of LiveWild and a great influence and she is still in our hearts so we feel she is still very much part of the team, influencing and inspiring us forever. Laura began leading Burn and Brae Wilderness School (Scots Language for Stream and Hill) in September 2015. Laura did an MA in art and illustration and enjoyed creative thinking and generating ideas. When she became a mum, she began to search for nourishing ways to grow and guide our children. She became involved with La Leche League – a breastfeeding and gentle parenting support network. She did the ‘First Three Years’ Course with the Steiner School in York and became inspired by connecting children with nature and gently marking the rhythms of the day. 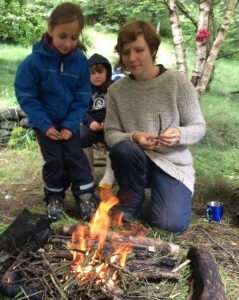 Through training as a Forest School Leader 7 years ago, she heard that there are many different ways around the world that people educate their children. She found Re-evaluation Co-counselling and enjoyed the amazing Liberation work and healing that this movement brings. Laura went to community camps, and starting learning about indigenous peoples wisdom in how society can be, about community, ceremonies and marking special occasions. She volunteered at a girls wilderness camp in Wales. A few years ago, she heard about ‘The Art of Mentoring’, went to an introduction to The 8 Shields in Ireland, loved it and went to do Ring 1 of The Art of Mentoring in Scotland and then Ring 2 the following year. She took part in a Life Stage Honouring course led by Sal Gencarelle – learning the importance of marking life transitions- different periods in our lives and how it leads to our well being and healthy culture. She also made environmentally responsible Jewellery using designs inspired by nature, storytelling and herbal lore. She learned to read the tracks left by our wild creatures and understand the language of birds.